You can make a tremendous difference in the outcome of abortion and euthanasia in our country. You may have asked yourself 'what can one person do?' Well, you won't be doing it all: you will be joining with thousands of other Australians who no longer wish to live with the status quo but wish to live in a country where all human life is respected and valued! Financially support our work and give to a cause that keeps on giving. 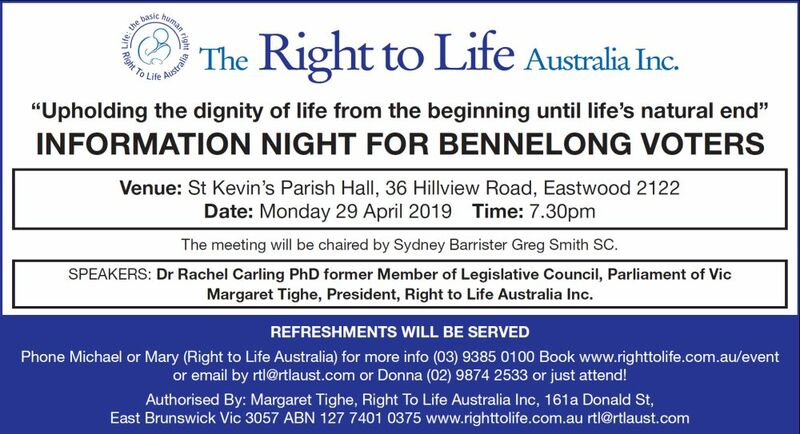 Join in our regular events and stand up for life. Put a pro-life bumper sticker on your car. Write letters to your MP, both state and federal on the issues of abortion, euthanasia and embryonic stem cell abuse. These letters don't have to be long. Simply tell them your position on these issues and tell them how you would like them to vote or act on your behalf. Visit to your local markets or garage sales and purchase baby/maternity clothes to donate to your nearest pregnancy help centre. Spread the pro-life message with literature. At Right to Life Australia we have a range of flyers and leaflets on life issues that are excellent for sharing with family and friends. Arrange for a pro-life speaker to do a presentation for your club, school, church or civic group. Consider adoption or foster care. Volunteer your time with Right to Life. Sort and wash baby and maternity clothes. Help get newsletter and mailings out. Be a telephone operator and call on our supporters to update their details and notify them of the latest campaigns and appeals. Type, file and assist with other office duties. Join the speakers list and train to give presentations on pro-life issues. Man pro-life tables and stands at local community events. Co-ordinate volunteers for any of the above. Fo r more information and ideas on how to be actively pro-life, please contact us.